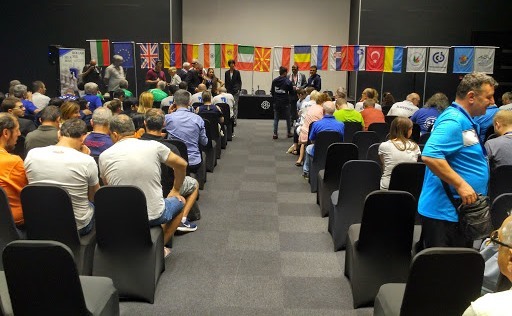 On July 21st 2018 started the 8th IBCA World Team Chess Championship for Blind and Visually Impaired people in Sofia, the capital of Bulgaria. 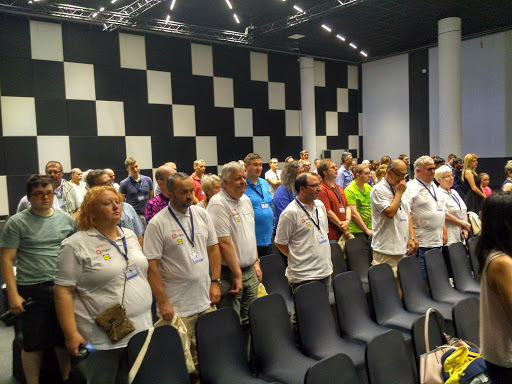 The opening ceremony was in the hostile and chess styled atmosphere of the Efe hall of hotel Marinela in the capital of Bulgaria. The organizers are the International Braille Chess Association (IBCA) and the Bulgarian Federation “Sports for Visually Impaired”. The Chairman of the Bulgarian Sports Federation Sport for the Visually Impaired People, Ivan Yanev greeted the guests and expressed his satisfaction with the fulfillment of the federation idea to host the World Team Chess Championship for Blind and Visually Impaired. 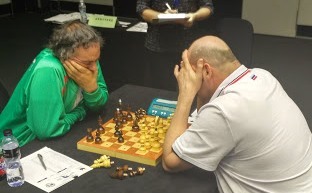 This is the first world chess championship for people with visual disabilities in the history of Bulgarian sport and one of the biggest sport events for visually disabled people since 1983 when Bulgaria hosted the European athletics championship for visually impaired people. The efforts to provide resources and support for the organization of the large chess forum started in 2015. The federation got the cooperation of the Union of the Blind in Bulgaria, the Sofia Municipality and the Ministry of Youth and Sports. Мany popular persons stand behind the championship`s organization - the minister of Bulgarian sports Krasen Kralev, the major of Sofia - Yordanka Fadakova, Angelina Angelova, PR director of Victoria group and administrative director of Marinela group as well as many world famous Bulgarian champions - Rumyana Neykova, Maria Grozdeva, Mirela Demireva, Teresa Marinova, Plamen Markov and Dinko Agelov, paraolympic medalist as well as many others gave their support to the event which is part of the calendar of Sofia as an European capital of sports in 2018. Greeting speeches gave: Vasil Dolapchiev - the chairman of the Bulgarian union of the blind; the chairman of the International Braille Chess Association (IBCA) Charudatta, Jadhav from India; Kristiyan Vigenin the chair of the Committee on European Affairs and Oversight of the European Funds. The first moves in the tournament were made by Krasen Kralev, the Bulgarian minister of the youth and sports and IM Nizam Rasim. The promising visually impaired singers - Katrin Vitali and Virginiya Sabeva gave all the guests and participants the expected rest from the official part. In the championship take part the top 16 teams from the 15th IBCA Olympics, held in Macedonia in 2017. The teams come from 16 countries all over the world - Russia, Poland, Ukraine, Germany, Spain, Azerbaijan, India, Venezuela, Italy, Bulgaria, Great Britain, Macedonia, Slovenia, Romania and Turkey. 2 groups consisting of 8 teams each contest in a 7 rounds league. Each team has 4 players. The media partner of the event ChessBomb is streaming the championship live and offers computer analyses of each move. A live streaming and a commentary studio is represented from the famous Bulgarian chess player and coach - Gm Alexander Delchev. The rules in blind chess are same as those in normal chess. There are only a few modifications to the equipment aiding blind and visually impaired players. A special tactile boards and speaking chess clocks are used. The squares on the tactile chessboard are a little raised above the white squares on the chessboard. By touching the squares, the player is able to determine whether the square is black or a white one. Each of the squares on the board has a hole in the center so that the chess pieces can be fixed in these holes with a downward projection (nail). It fits into the hole in the squares on the board. 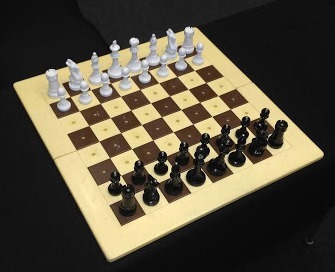 The black pieces are marked on their heads helping the player distinguish between a white and a piece. After making every move, each player is required to announce their move to their opponent. Instead of writing the moves on a chess score sheet, the visually impaired player writes the moves in Braille or records the moves on a tape recorder. The online streaming on electronic chessboards is additionally assisted. On the first day 4 pairs of teams competed their chess strength - Macedonia and Germany; Great Britain and Serbia; Bulgaria and Russia and Turkey and Venezuela. The pride and hope of the host team is the Bulgarian chess star Rasim Nizam. He is the first Bulgarian International Master of Sports with visual disability, holder of many Republican and Balkan chess titles. In 2015 he earned bronze medal at the World Team Chess Championship for Blind and Visually-Impaired in Seoul. In 2017 Nizam ranked 6th at the World Chess Championship for Disabled People in Dresden. The results of group A after the first rounds in the first day of the competition. The results of group B after the first rounds in the first day of the competition. The championship arbiter's team is headed by Dr Radislav Atanasov, chess lecturer at the National Sports Academy. Among arbiters are the famous GM Emilia Djingirova and GM Rujka Geova. Watch the games of the VIII IBCA World Team Chess Championship 2018 with computer analysis LIVE on ChessBomb. Watch live the commentary studio of GM's Alexander Delchev at the VIII World Chess Championship for Visually Impaired People 2018. Interesting reviews and comentaries are offered from of our guests from ChessBase India - Round 1 commentary.